It wouldn’t be an ordinary week in today’s Venezuela without the highest court in the land taking over a political party to appoint a pro-government clique to lead it. This week saw the turn of the National Integrity Movement, better known as MIN-UNIDAD. The Constitutional Chamber admitted a motion by Alix Ramon Medina, head of the MIN’s Barinas State branch, who complained that the national leadership has selected candidates without consulting them. Several of MIN’s regional members supported his claims. The court has suspended the current board and replaced it with a new one (which includes Medina). The MUD responded by immediately expelling MIN-UNIDAD of the opposition’s grand coalition. Executive Secretary Jesus “Chuo” Torrealba said in an statement that: “We’ll not allow that the regime infiltrates their pieces inside the democratic camp, by using legal pretexts…”. The decision was taken unanimously by all MUD members last night, making it the second political party (after COPEI) expelled by the coalition this week. The MIN was founded in 1977 by Venezuelan television personality Renny Ottolina (pictured) in order to run for President the following year. Sadly, he died in a plane crash in March of 1978. 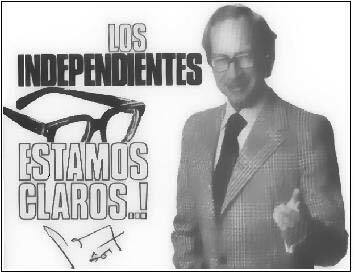 His party continued with Gonzalo Pérez Hernández at the helm and using Renny’s iconic glasses as its symbol but it didn’t achieve any major success in the polls. In 2005, the MIN electoral card became valuable as the opposition’s alternative to Chavismo’s use of the electoral trick known as “morochas”. The party officially changed its name to MIN-UNIDAD to suit that role, until now. As days go by, the government continues to uses all the resources available to block its adversaries for the upcoming legislative election, even among its own ranks. This week, three other opposition candidates were disqualified to run: Political prisoners Raul Emilio Baduel and Alexander Tirado in one hand and Tachira MP Abelardo Diaz in the other. Diaz happens to be member of COPEI, intervened by the TSJ one week ago.